Fire Ants: Avoid the Burn! Excited to get outdoors after all this rain only to find that mounds of fire ants have taken over your yard? In late-spring and early-summer it can seem like huge fire ant mounds pop up overnight. It can be challenging to eradicate fire ants from your yard completely, even with the use of harsh chemical treatments. As an organic gardener, or someone that uses an organic service, there are actually very effective organic fire at treatments at your disposal. That being the case, why expose your family and pets to harmful chemicals in your landscape if you don’t have to? Which fire ants are the culprit? There are many species of fire ants that are native to North America. However, the one that causes us the most pain here in Texas is actually native to Brazil. In the 1930s, this fire ant species was accidentally brought to the U.S. by way of soil that was used as ballast in cargo ships. Here in the U.S., unlike In Brazil, we have no natural predators to keep them under control. As a result, fire ant populations have now exploded out of control. Did you know? We now have almost ten times more fire ants here in the U.S. than in Brazil! Fire ants deliver painful stings that swell and can become infected. While it’s tempting to resort to harsh chemicals to wipe out fire ants in your yard, know that there are several highly effective organic treatment options. Naturally derived botanical oils, such as Wintergreen, are used effectively as mound drenches. Spinosad, the active ingredient in many organic treatments, is produced by a soil-borne microbe. The metabolites the microbes produce are harvested and used as a bio-pesticide. Organic fire ant control products containing Spinosad are found in liquid products and dry fire ant baits. Beneficial nematodes are microscopic organisms added to the soil that feed on soft bodied insects or insects that have a larval stage of life in the soil such as fire ants, fleas and even grubs, the larval stage of the June Beetle. Beneficial nematodes are highly effective at reducing large percentages of fire ant populations in your landscape. 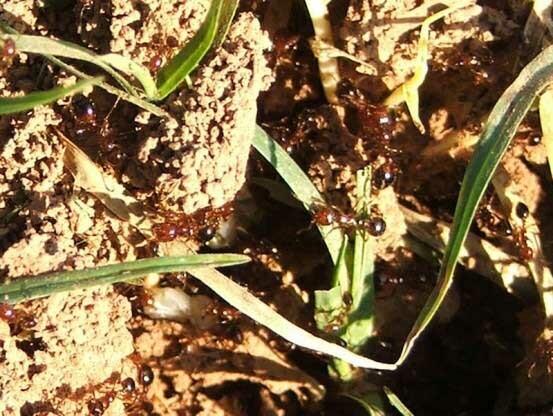 If you’re one of our Soil Building Program customers, you’ll be receiving regular doses of beneficial nematodes in your lawn treatments; and if you have an infestation crop up, we can also provide quick knock-downs of fire ant mounds organically, through a combination of botanically derived liquids and baits.